What kinds of school are there in Japan? There are some information about Japanese educational system, and kinds of school in Japan on this page. So I hope that the information would help you if you want to study in Japan. At beginning, I would like to write Japanese educational system. How do Japanese study at their school in Japan? I draw the bellow illustration to describe it. 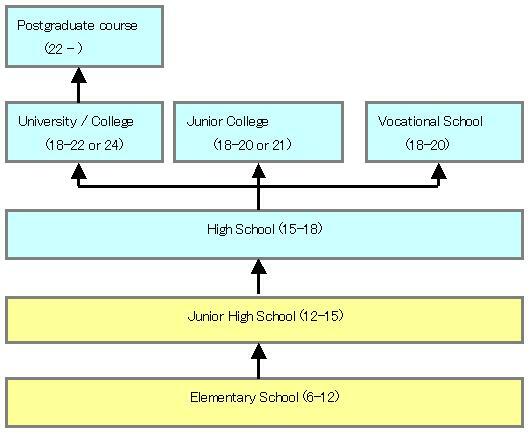 On the illustration, the number means the age of the students and the yellow boxes are the schools for compulsory education, and the blue boxes are the schools that the students are required to pass the selection examination to enter it. There are three kinds of schools, which are the national school, prefectural or municipal school and private school, in Japan. Usually, the costs of private schools are more expensive then the others. Then, I'd like to describe each school from next. Japanese university and college are the schools that students can study and research a lot of wide knowledge and deep technological skills for each special fields, and students would get the wisdoms to analyze some problems and solve them by themselves. Some of the curriculums have some presentations and debates in some schools, the experiences and knowledge would help them after graduated even if they work a company whose field is difference from their major in their school. Finally, they can get a "Bachelor Degree" after graduated. The student's term of school is usually four years, but the terms of school of medical science, dentistry, clinical medicine and veterinary medicine are six years. The students should earn enough credits to graduate, in additionally the students have the graduation thesis that is for the students of liberal arts or the graduation research that is for the students of science students. If a student can't earn enough credits, the student can't graduate the school. The universities have several kinds of departments and course of study, so you can select one with your dream and ambition. The students usually study for two years at their junior college, and they can earn "Associate Degree" when they graduate. But they need three years to graduate at the science of nursing and sanitary engineering colleges. And some of the junior colleges give the chances to enter some universities or colleges, for example attached to some private universities and so on. The junior colleges don't have any departments, but they have some course. So you can select your suitable course with your purpose. When the students graduate with some necessary condition, the students can get "Senmon-shi" or "Kodo-Senmon-shi". Vocational schools are difference from universities and colleges and junior colleges, the purposes are mastering enough technical skills. There are some Vocational schools that have some good curriculums to earn some licenses, or enter any universities or colleges or junior colleges after graduated. So, it's the good way to think your future after graduated when you select a Vocational school. Japanese Language School is for people whose mother languages aren't Japanese, and the students learn Japanese language skills. In different words, the school helps the students who already have enough skills or knowledge to enter Japanese university or college or to get an employment opportunity at Japanese companies in learning Japanese language. In additionally, some universities and colleges and vocational schools also have some courses to learn Japanese language at their Japanese language courses, I would like to recommend you to research these information. Japanese language schools help us to learn Japanese language. So we can't read only such information as Japanese language ability, Japanese language proficiency test, but we can also check out the way to find our best Japanese language school and the list of Japanese language schools on this page. Elementary school, junior high school and high school start from April 1st, and they have three terms. First term starts from April to July, second term starts September to December, and third term starts from January to March. And the schools have three vacations after every term, which are summer vacation, winter vacation and spring vacation. However, universities, colleges, junior colleges and vocational schools are difference and it depends on their curriculums. Usually they have two terms in a year, and first term starts from April to July, second term starts from October to January. And there are summer vacation and winter vacation between the terms. Then I would like to write the feature of the schools easily.